Get set for a weekend that'll have you flying! Not sure what drones, data and tech mean for you or your business? Ready to take the next step with your current technology? Chomping at the bit to see real demonstrations in the field? Strap yourself in for a great weekend where you'll have unprecedented access to discussions with leading drone, data and tech professionals, in-field demonstrations, trade show and more. Our Outback Aerodrone Symposium 2018 program has just landed featuring the fantastic line up of speakers so far. But this is just the beginning; follow us on Facebook, Twitter or LinkedIn for regular updates, with more speaker and program announcements to come. Take a look at our ticket packages and register now online. 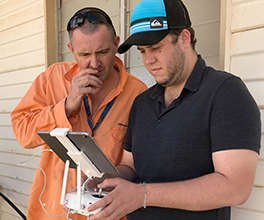 Meet and listen to some of Australia’s leading drone and data experts Better understand the value and relevance of drone, data & technology options to your business. Come fly in our backyard!